If you hadn’t noticed, the Rand is at a 5-year low against the dollar, which makes everything from flights, to lodging, to food available at discount prices. As this article points out, expect a meal for two for under US$20, hotels and hostels at basement prices, and if you book early enough, flights from North America have been dipping below US$1000 lately on South African Airlines. 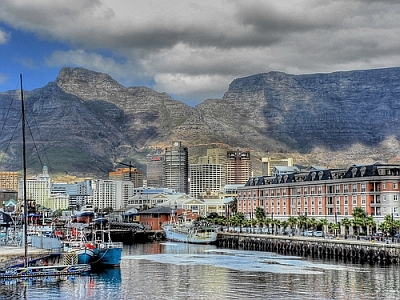 As mentioned already, Cape Town is consistently ranked one of the best cities in the world to visit, yet it rarely feels overrun like other popular destinations. I doubt the same will be said post-World Cup when the world finally sees what they’ve been missing. So go now while you can still enjoy it (mid-January to April is usually suggested for the best time to visit). There’s almost too much too see while you’re there. Iconic Table Mountain has over 550 trails that you can explore; Robben Island, the prison where Nelson Mandela was imprisoned for 18 years, is just a short boat ride away; and the beaches around Cape Town offer everything from swimming, surfing, shark cage-diving, and cohorting with penguins — and for the true adventurer try combining all four at the same time for the ultimate experience!